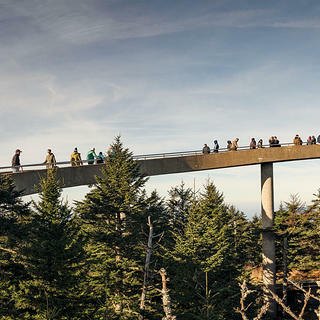 Since 1959, Clingmans Dome Observation Tower has provided visitors to Great Smoky Mountains National Park and hikers on the Appalachian Trail with unmatched views from the highest point in Tennessee. But age and harsh winter conditions have affected the spaceship-like tower and its snaking ramp, prompting the National Park Service (NPS) to coordinate a rehabilitation effort that finished last summer. The 45-foot-tall concrete observation tower was constructed on Clingmans Dome in the early years of the NPS’ Mission 66 program, a decade-long endeavor to refresh and expand park facilities to accommodate the influx of visitors leading up to the Park Service’s 50th anniversary in 1966. These Modernist structures were meant to enhance the public’s experience in the parks, not to draw attention. Clingmans Dome Observation Tower doesn’t completely blend into the spruce and fir trees, though. It’s one of the most popular stops in the park not only for the surreal view of the Smokies it provides, but also for its midcentury design. It’s one of only nine Park Service observation towers built during the Mission 66 era. 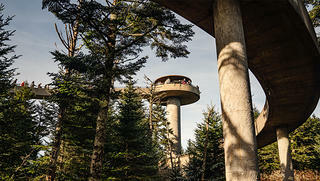 The observation tower at Clingmans Dome sits on a 6,643-foot-tall mountain. There have been minor repairs over the years—repointing the mortar, adding new layers of concrete—but the observation tower continued to weather. The entry plaza, the 375-foot-long ramp, its sidewalls and eight supporting columns, and the domed platform all showed signs of deterioration: spalling (chunks of concrete falling off), cracking from repeated freeze-thaw cycles, and pockets of water that formed in the joints between rusted rebar and concrete. The tower’s height (it sits atop the 6,643-foot mountain), the ramp’s narrow size (just 6 feet wide), and poor winter weather conditions created a challenging project, but there was also the question of funding. In 2016, Great Smoky Mountains National Park received a $250,000 grant from the National Trust’s Partners in Preservation program, a collaboration between the Trust, American Express, and National Geographic. The park provided another $52,000. With funding at hand, the project commenced at the end of August 2017, when a small crew of six tackled the entry plaza before heading upward to the ramp and observation platform. They repaired or replaced broken and missing flagstones on the plaza and repaired two concrete seatwalls that encircle it. The team then applied a 1-inch-thick polyester polymer concrete overlay on the ramp’s surface, filled in cracks, and patched sections of spalled concrete across the platform and supporting columns. The tower remained open to visitors while it was being repaired. The rehabilitation process officially concluded in August of 2018, providing visitors with not only impressive mountain views, but also a spruced-up Mission 66 icon from which to take it all in.